This past week marked the 20th anniversary of the giant impacts of the comet Shoemaker-Levy 9 onto Jupiter. The comet had been pulled apart by tidal forces from a previous close passage by Jupiter into 22 ice-rock chunks that struck Jupiter over a period of six days in mid-July 1994. It was the first direct observation of something impacting a planet. Shoemaker-Levy 9 left several Earth-sized dark brown scars in Jupiter's atmosphere that took several months to dissipate away. More importantly, the collision of Shoemaker-Levy 9 showed that impacts are not something of the distant past but can still occur today. Jupiter's strong gravity might play a key role in enabling complex (multi-cellular) life to arise on the Earth because Jupiter's gravity attracts numerous asteroids and comets that might otherwise find their way into the inner solar system and collide with the Earth. An impactor a kilometer or more across hitting the Earth would wipe out many forms of complex life. Without a Jupiter-sized planet in the outer solar system, extinction-level impact events would be much more common on the Earth; too frequent for complex life to develop. Astronomers working with the Gaia mission that is mapping the positions and motions of a billion stars will look for planetary systems that could have complex life developing in them by finding those systems with a Jupiter-sized planet in the outer parts of the system. The Gaia spacecraft cannot detect something as small as the Earth directly because such small planets wouldn't produce a large enough reflex wobble in their host star for Gaia to measure. The small planet simply doesn't have enough gravity but a large planet does. This reflex wobble arises because gravity works both directions. The gravity force acting on the star and the planet are the same but the motion of the planet is much greater than the more massive star. The star has a small back-and-forth motion as the planet orbits it. Larger planets make larger star wobbles and Gaia can measure the reflex wobble of a star due to Jupiter-sized planet orbiting it. If the Jupiter-sized planet is in the outer part of the planet system, say more than 3 times the distance the Earth is from the Sun, then it would be possible for smaller planets to reside in the warmer habitable zone of the star. The large planets at those distances would also provide a gravity shield against comet impacts for smaller planets in the habitable zone, so that if life did get started on the habitable planets, it could have a chance of eventually developing complex life. Planet systems with this nice arrangement of Jupiter-sized planets would be investigated further with even more powerful techniques to see if there are indeed small planets in the habitable zone. In other space exploration news, the Orbiting Carbon Observatory-2 (OCO-2), launched successfully at the beginning of the month and will become the sixth member of a set of satellites called the "A-train". Satellites in the A-train, orbit on the same track behind each other, all observing various complementary aspects of the Earth's surface and atmosphere. While OCO-2 will be focussing on measuring carbon dioxide levels, other satellites in the A-train measure minute particles in the atmosphere called aerosols, clouds, temperature, and water content in the atmosphere. By the way, the "2" in the satellite name means this is the replacement for the original OCO that was destroyed when the launch rocket failed. Earlier this year, the Global Precipitation Measurement mission launched to map global rainfall and snowfall every three hours. Later this year the Soil Moisture Active Passive (SMAP)mission will launch to map soil moisture and the freeze/thaw state of all regions of land on the globe. Together, these two satellites will lead to a much better understanding of the water cycle, climate, drought prediction, and flood forecasting all over the world. Also, later this year, the ISS-RapidScat instrument and the Cloud-Aerosol Transport System (CATS) will launch to the International Space Station. The ISS-RapidScat instrument will monitor ocean winds and CATS will measure the location, composition, and distribution of pollution, dust, smoke, and aerosols in the atmosphere. All of these satellites and other science satellites launched in the past couple of years will give us the information we need to truly understand the details of the Earth's climate. In tonight's sky, you'll be able to see Mars and Saturn in the evening and Venus and Mercury in the pre-dawn morning sky. Jupiter is now too close to the Sun on our sky to see. It passes behind the Sun on July 24th. As the Earth continues leaving Mars behind in our faster, inner orbit, Mars has become a bit dimmer than at the beginning of the month and Mars has moved from being to the right of the bright blue-white star Spica in Virgo at the beginning of the month to now being to the left of Spica. 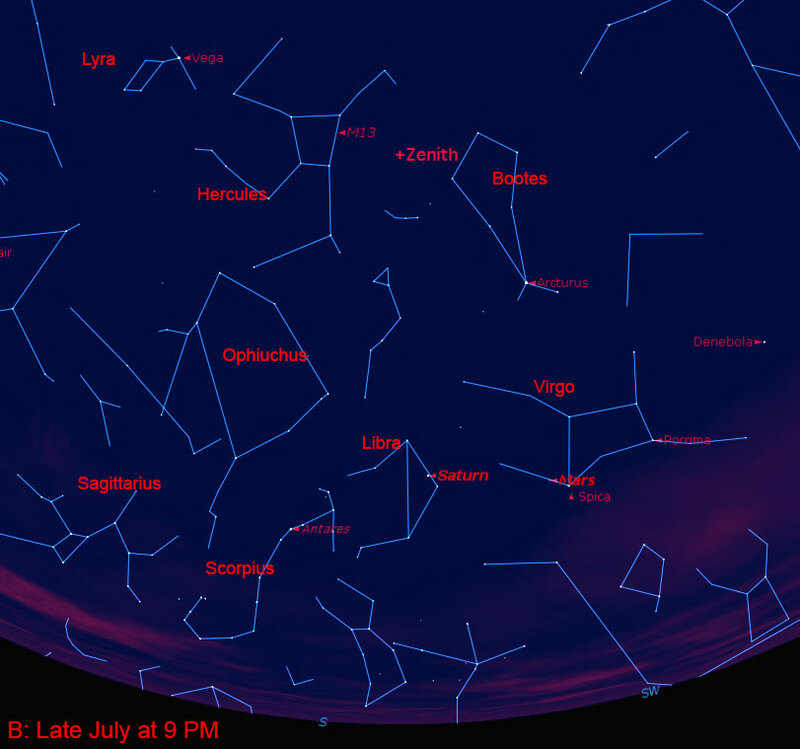 See the second star chart below for the view of the evening sky. Mars and Spica will set around midnight. Saturn has been moving backward or retrograde for the past few months but it will stop that on the 21st and begin moving eastward again. Speedier Mars will catch up to Saturn near the end of August. Early risers will be able to see bright Venus rising as the sky begins to brighten with the approaching sunrise. 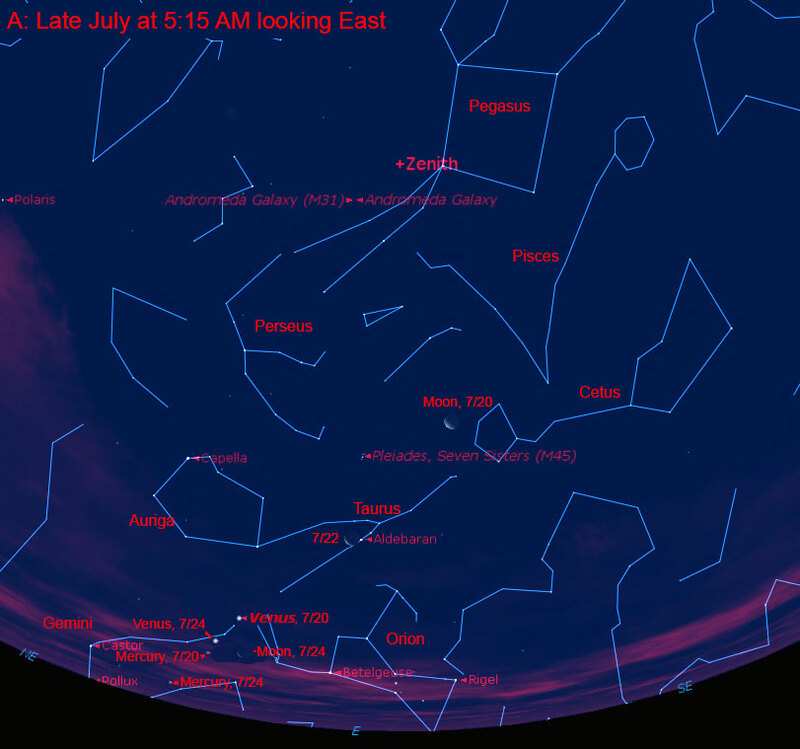 The first star chart below shows the pre-dawn morning sky at 5:15 AM. Venus will be at the foot of Gemini. Venus will be the brightest star you see low in the eastern sky. Mercury will be the bright star farther down to the lower-left of Venus. A fat Waning Crescent Moon will be higher up in the sky. A skinnier crescent Moon will pass right next to the orange-red eye of Taurus, the star Aldebaran, on the 22nd and a very skinny crescent Moon will be next to Venus and Mercury on the 24th and 25th, respectively. Finally, at the end of the month, on the 28th, the Delta Aquarid meteor shower will be at its peak. It is a fairly modest meteor shower and those further south of us have a better view of it. Don't forget the free public star party on August 2nd!